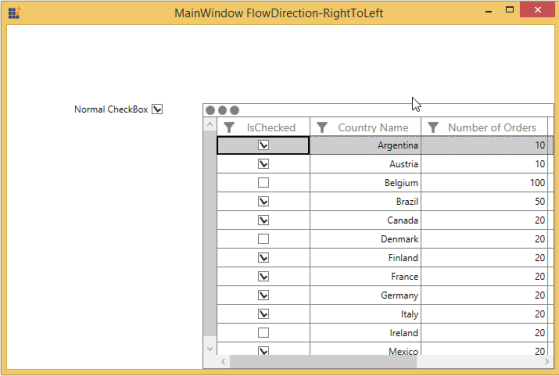 How to resolve the mirror issue in GridCheckBoxColumn when the FlowDirection is changed? 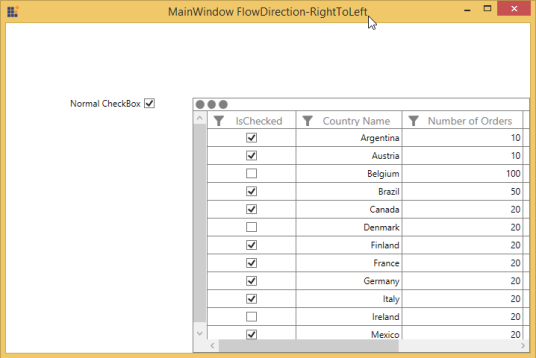 In WPF, when changing the FlowDirection as RightToLeft, a mirrored image appears for CheckBox control and you can see it displayed here in the following screenshot, with GridCheckBox column in SfDataGrid. Based on the discussion about this in MSDN forum, you can fix it by changing the default control template of CheckBox and set the FlowDirection to the Path object as LeftToRight as shown in the following code example. By setting the default value of the FlowDirection to LeftToRight, you can overcome this issue in the GridCheckBoxColumn of the SfDataGrid. Note: This mirror bug in CheckBox appears only in Windows 8 and Windows 8.1 OS.